Halloween is over now, Thanksgiving is almost here and Christmas is right around the corner. The nature has started throwing a range of colors on the trees. Shades of green, yellow, orange and red are all over the place. And before you have time to take in everything, leaves have started falling to the ground making the trees bare. The competent trees in the neighborhood have already shed its leaves. Slowly, a whole bunch of them follow the leader. And within a very short time span, there is a whole lane of trees that are just sticks and branches now. I am thankful for the ones that are still holding onto their leaves with their lives, making this beautiful display of red and orange and yellow. It makes you feel a little warm amidst the setting cold weather. All I want to do is have a hot cup of tea, pair it with something spicy, throw a blanket on myself and read. This dish may not be perfect with a cup of tea, but it is great with hot rice or vegetable rice. Food…well, that’s how you get ready for winter at my place ;-). Heat oil. Add the red chilli, curry leaves and the mustard seeds. Wait for the seeds to crackle. Add the chopped onion and saute till its pink. Tip in the diced capsicum and let it cook for 2-3 minutes. Add the chili powder, coriander powder, garam masala and ground pepper along with salt as needed.Mix well. Now add mushrooms and mix gently. Let it cook until soft. Taste test, adjust seasoning according to your taste. Take off the heat when the moisture from the mushrooms is all dried up. Serve with roti, fried rice or plain rice. 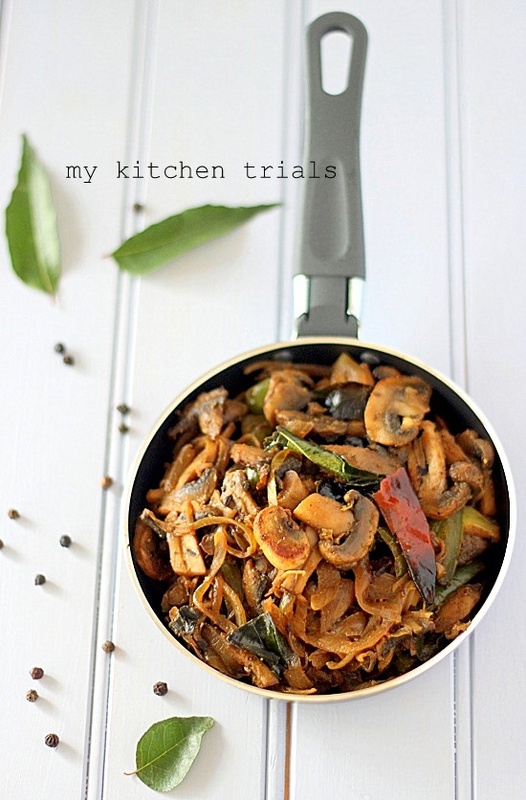 This dish looks wonderful….all I need is some rotis to go with. Leaves of the deciduous trees changing color and falling off is a pretty sight indeed. Pictures look great. What a wonderful fry this is! 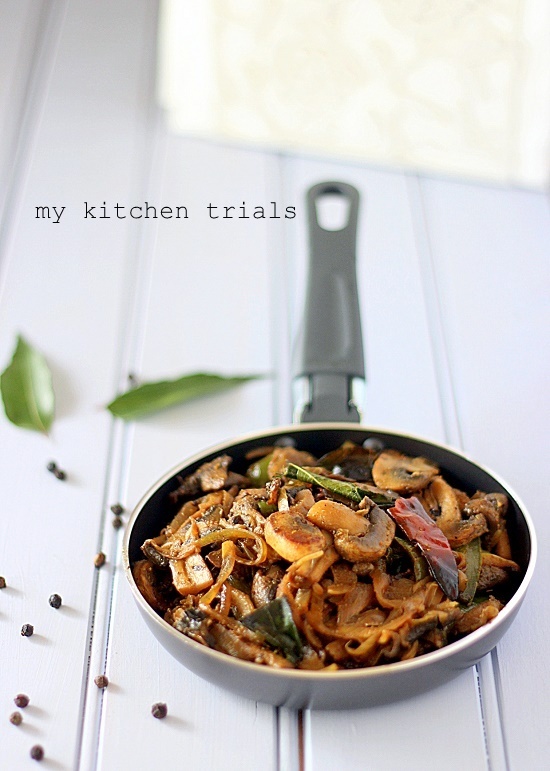 Works great with rice or roti. 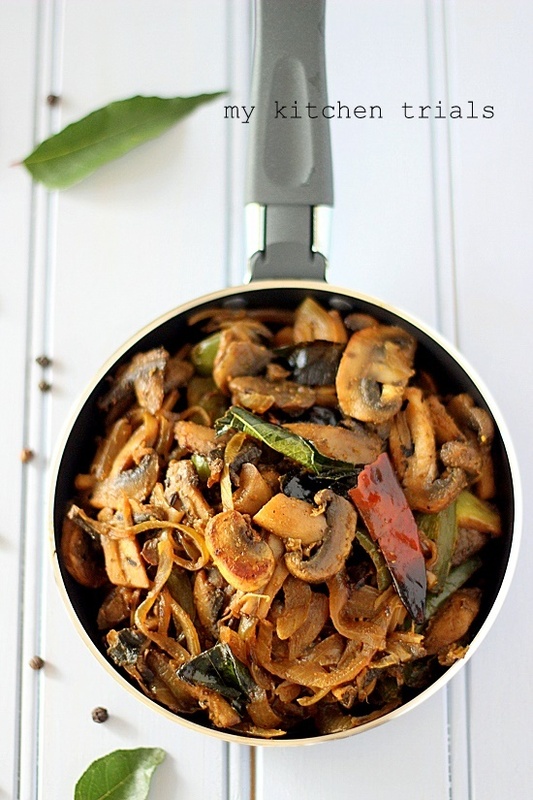 Super delicious mushroom pepper fry, just need some rice and rasam to enjoy this ultimate dish. Mushroom is a favorite of Mr. H and he would love this fry .Pictures are very beautiful . Not a mushroom fan but the pictures are quite inviting. Fall is such a lovely season, isn’t it? I love the bright yellows and reds this time of the year. Here, all the trees are well past their peak and are bare bark and stumps now. Gosh the picture is fabulous Rajani..those planks are awesome really! I don’t eat mushrooms but I am sure mushroom lovers will appreciate it.